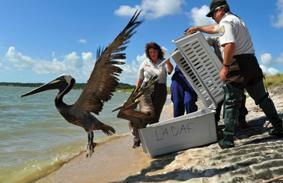 A brown pelican stretches its wings and flies to freedom: this joyous photograph captures the moment that a bird rescued from the oil spill in the Gulf of Mexico is released at Aransas National Wildlife Refuge in Texas. So much more to do! but is sure is nice to see this one Fly Free! So touching. At least there are some humans willing to undo the harm done by the greedy ones. I hope this bird has a long and happy life. A bit of light in an otherwise dark story! She or He is gorgeous! I love the Pelis...like mini teradactyls. I hope she stays healthy and makes it! I just hope it doesn't head straight back into the corporate oil oops (as they would say).